Part 2: Your "Primary Source of Income"
I am a doctor, corporate executive, entrepreneur, author, and speaker. My wife (Jill), our 6-year-old daughter (Joie), and our 3-year-old daughter (Jae) live in Tampa Florida and Newport Beach California. "Money and Happiness": Your "Primary Source of Income"
This is far beyond a “How To” concept. It is rather a “Do” system, which, when used in conjunction with the BeHappy! book and The Happiness Academy (coming before the end of 2013), helps create your own personal “Happiness Plan” for your life. If you want a template or “blueprint” for this Happiness Plan, click here and you can get it free. A recent survey of 30,000 workers worldwide showed that between 28% and 56% of employees in 17 countries around the globe wanted to leave their jobs. People with professional jobs that involve helping or serving people have been shown to be more satisfied with their work and overall are happier than those in other professions. Only 20% of people surveyed indicated that they feel "passionate" about their job. The previous edition of this newsletter in June was the start of a 3-part series on “money” and happiness. It first discussed the concept of the connection between money and happiness, and how some people believe there is no connection while others believe there is. Well, if (1) you are one of those people (like me) who believes there is some possible relationship between money and happiness (if it's part of your personal Definition of Happiness), and (2) you don’t have enough money to meet the financial criteria for your personal Definition of Happiness then you really need to study this series carefully and take the actions recommended. So, first, if you have not read the June edition of this newsletter, you should do so now. Just click here to read it, then come back to continue with this edition. If you did read it, did you determine if your personal Definition of Happiness includes a financial, income, or wealth component? Again, if you haven’t done this, it is critical that you do if you really want to have more money, income, wealth, and/or financial freedom. Finally, if you have read the June edition, did you check out the “Rippln” income opportunity presented in the past two issues? If not, take a minute to check it out now by clicking here or on the big orange icon in the box above. It’s not for everyone, but it will only take a few minutes of your time to check it out and, if it is something that interests you, I think you’ll be happy you did. There is still time to get in on the “inner circle” of this new ground-floor social media opportunity as Rippln is currently in the process of launching to the public and it is expected to go “viral” very soon. So, don’t miss out!! Click here now to check it out for yourself. Job: A paid position of regular employment; a task or piece of work, esp. one that is paid. Work: Mental or physical effort or activity as a means of earning income. Play: Engage in activity for enjoyment and recreation rather than a serious or practical purpose. Career: An occupation undertaken for a significant period of a person's life and with opportunities for progress. In my ebook, BeHappy! at Work (click here to see how to get a FREE copy), I introduce a phrase that I prefer to use instead of “job” or “work”. That phrase is “Primary Source of Income” (or “PSI”). I prefer this phrase over the words "job" or "work", since if you think about it, whether consciously or subconsciously, the words “job” and “work” create some degree of negative feelings to most people (since statistics show that 75% of people don’t like their job and most people don’t really like to “work”, and would rather “play”, which unless you consider your “work” a form of play, then it’s not a positive thing). Your Passion: The reason most people don’t love their jobs is because most people are not using their passion in life for their income. One of the "Happiness Facts" above indicates that studies show that only 20% of people are "passionate" about their job. Think about musicians, actors, and professional athletes. These are some of the most obvious examples of people who started by “loving something” (like music, acting, or a sport) and worked to build a career out of that “passion”. And, there are many other examples of using your passion for income that are not as “glamorous” as these. There are many people who are just as passionate about teaching, building, taking care of sick people, or any other “job” you can imagine. The point is, if you can use your “passion” in life to derive income, you will likely be happier and probably make more money. It is beyond the scope of this newsletter to get very deep into how to derive income from your passion – or even how to determine your true passion in life (if you don’t already know it) – but I go through a process on how to do these things in my ebook, BeHappy! at Work, which you can get for just $3.75 by clicking here (or, you can get a free copy when you order my foundational book, BeHappy! 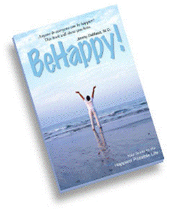 for 50% off – just $7.50 – by clicking here and I'll send you a free copy of BeHappy! at Work, as well as another ebook on stress management). In the meantime, if you either are not using your passion in life for your income AND you do not like your “job”, make sure to take the actions recommended below... and also make sure not to miss the October edition of the newsletter, where I will discuss creating multiple streams of income – which can eventually help free you from a job you don’t like (NOTE: I had intended on covering this multiple streams of income topic in this edition of the newsletter, but decided it would be better after this discussion on “primary source of income”). Take these actions over the next sixty days and by the time you receive the next edition of the BeHappy! Newsletter (in October), you will be well on your way to creating a life of financial stability, abundance, and freedom, along with happiness, joy, and fulfillment. How does your “primary source of income” (i.e., your current “job” or career”) relate to your passion(s) – if it does at all? How can you incorporate more of what you are passionate about in life into your current “job” or career? If you feel there is truly no way to incorporate your passion(s) into your current job (although there usually is a way – even if it’s not obvious at first), then do you either (a) need to make a drastic change in your career or is it a MUST that you start creating an additional source of income which could eventually substitute for your current source of income? OK, I’m sorry to do this to you, but once again, a more thorough process for evaluating your passion and using that passion for an income is available in my ebook, BeHappy! at Work. So, if this issue is important to you – and you want to change your life for the better – click here to get it now for just $3.75 (or find out how to get a FREE copy by clicking here).